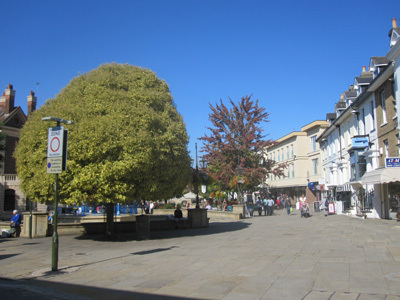 The sky is that special shade of blue, the trees are starting to turn and the morning air is crisp and redolent with the scent of fallen leaves; autumn must be approaching. This is the time of year I always associate with cider (real, cloudy, non-alcoholic apple cider) and apple-cinnamon donuts; even now—after ten years in Britain where I remain bereft of these familiar comforts—I still feel an ache of emptiness at their absence. In Britain, autumn has its own traditions: the reappearance of youngsters wearing school uniforms, the sudden overcrowding of the 7AM bus with sleepy teenagers on their way to one of the institutions of higher education in the Brighton area and the unwelcome availability of Christmas cards in every store from ASDA to Dixons. The most enduring, however, is Conkers. Conkers is a game children play in school involving horse chestnuts on a string and the subsequent banging of them together. It is, I suppose, something you have to grow up with to understand. My wife tells me that, in her day, this game was accompanied by hopscotch, jump rope and marbles as children returned to school and assembled in the play grounds. In my day, we had jump rope and hopscotch, too, but I think all of those games, on both sides of the Atlantic, have fallen by the wayside, replaced by Xboxes, DS3s and iPods. Only Conkers, it seems, remain, and I have to wonder why that is. Is it because of it being so deeply ingrained in the British way of life? Or is it because Health and Safety keeps trying to ban it, and the surest way to get kids to do anything is to tell them they can’t. 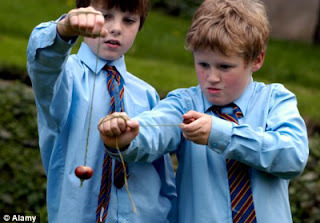 Whatever the reason, Conkers, for the time being, at least, continues to remain an integral part of a British childhood. This pleases me because, in my mind, Conkers has been woven into the fabric of the yearly cycled, and it serves as a signal, telling me when to start longing for cider, cinnamon-apple donuts, and The Tatter Digger. As autumn traditions go, you will have to look hard to come up with one more esoteric than Tatter Digger Fights, but these were an important—and much looked forward to—part of my childhood. 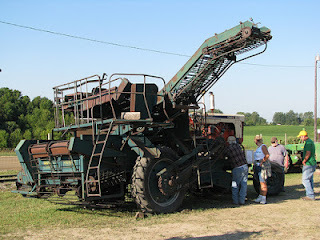 Every autumn, the potato fields around our house were harvested by a gigantic, screeching, squealing and fearsome looking contraption called a Tatter Digger, and when it was left resting in the fields over night, it became our playground. What we did was divide into two teams, with one holding the Tatter Digger like a fort, and the other dispersed into the dark field to plan and plot and launch attacks. We used potatoes for weapons, as they are not as hard as rocks but still let you know when you’ve been hit. Also, there were a lot of them lying about; the belts and conveyers and bins of the Tatter Digger were filled with them, and the field team had no problem gathering up an arsenal, even in the dark. What The Tatter Digger Fight amounted to was a huge game of King of the Hill fought with potatoes and the prize being possession of the awesome machine. Because of its seasonal nature, we played every night we could and stayed out until our moms called us in for bath time. A Tatter Digger. And, you, those guys is farmers. So I suppose, if it is my childhood I hear calling to me over the long years, perhaps I can recapture its essence by finding a potato field and sitting in the middle of it some evening. Silly, yes; but I’ll have a better chance of achieving that than of getting a cup of real cider and a cinnamon-apple donut.